¶ Gneissic continental basement rock is suggested here to be extraterrestrial in origin, from aqueously-differentiated Kuiper belt objects (KBOs), with terrestrial emplacement during the late heavy bombardment (LHB), circa 4.1-3.8 Ga.
¶ An extraterrestrial origin for gneiss requires an alternative solar system origin as well, with hot classical KBOs ‘condensing’ by streaming instability against Neptune’s outer 2:3 resonance from a siderophile-depleted debris disk prior to 4,567 Ma. ¶ Secular perturbation of a former binary-Companion to the Sun is suggested to have caused its super-Jupiter-mass binary components to spiral in over time, progressively increasing the Sun-Companion eccentricity over time. Progressive Sun-Companion eccentricity caused a ‘tidal inflection point’ (associated with the Sun-Companion barycenter) to spiral out through the Kuiper belt, perturbing KBOs into the inner solar system, causing the LHB of the inner solar system. ¶ Ultimately, the binary components of binary-Companion merged at about 650 Ma, in an asymmetrical merger explosion that gave the newly-merged Companion escape velocity from the Sun. ¶ The formation of KBOs by streaming (gravitational) instability converted the considerable kinetic and potential energy of the debris disk dust and ice into heat in the process of undergoing freefall collapse by gravitational instability, with ‘large’ KBOs exceeding the melting point of water ice in their cores, thus initiating ‘aqueous differentiation’. ¶ Heating caused by gravitational collapse was followed by radiative cooling, of the newly ‘condensed’ trans-Neptunian KBOs. Radiative cooling caused the newly-melted core saltwater oceans to begin to freeze solid, causing precipitation of authigenic sediments of aqueously-dissolved nebular dust. Authigenic precipitation is suggested to have formed sedimentary cores with a gneissic composition, where mineral grains fall out of aqueous suspension at mineral grain sizes dependent on the microgravitaitonal acceleration and circulation rate of the core saltwater oceans. ¶ Much of the authigenic sedimentation was apparently modulated into migmatite sediments, presumably by sawtooth pH variations, forming felsic leucosomes and mafic mesosomes/melanosomes. The internal densification of KBOs, caused by aqueous differentiation, presumably created numerous ‘KBO-quake’ subsidence events, which subsidence shocks causing dissolved CO2 to catastrophically bubble out of solution, suddenly raising the pH. ¶ Aluminous mineral-species solubility is particularly pH sensitive, such that when subsidence shocks catastrophically raised the pH, aluminous minerals rapidly precipitated, predominantly as felsic feldspars. Thus felsic leucosomes are suggested to have precipitated rapidly following subsidence events, while the more-mafic melanosomes precipitated in the relative quiescence between repeated subsidence shocks. ¶ The KBO core rock that constitute the continental tectonic plates on Earth are suggested to have predominantly impacted during the LHB, followed by variable degrees of terrestrial metamorphism, while deeply embedded within their terrestrial impact craters. ¶ Geochronology of sedimentary KBO core rock dates to its apparent age at its closure temperature. As gneissic KBO core rock exhumes from deep within its LHB-era impact craters, the rock undergoes retrograde metamorphism as it depressurizes and cools, and at the ‘closure temperature’, mineral grains begin to retain the daughter products of radioactive decay, starting the geochronological clock, which was reset by the high temperatures inherent in terrestrial metamorphism. ¶ Alternatively, primary authigenic sedimentation with felsic-mafic modulation replaces the ad hoc secondary mechanism of anatexis, with its inherent mass balance problem. ¶ Aqueous differentiation presumably occurs at formation by streaming instability (gravitational instability), where the kinetic and potential energy of a Jeans mass of gravitationally-collapsing dust and ice melts water ice in the cores of newly-formed KBOs, accompanied by dissolution of nebular dust into the dissolved state, of ions and cations. Subsequent radiative cooling of the KBO, causes freezing of water ice, precipitating authigenic mineral grains that grow in size until falling out of aqueous suspension at a mineral grain size dependent on the local microgravity and aqueous circulation rate. ¶ The felsic-mafic modulation is suggested to be governed by the ocean pH, which is catastrophically increased in KBO-quake subsidence events that cause CO2 to bubble out of solution, accompanied by carbonic acid converting to gaseous CO2 to rebalance the carbonic acid to gaseous CO2 ratio. The solubility of aluminous mineral species is particularly pH sensitive, such that aftershocks which caused carbon dioxide to bubble out of solution result in rapid sedimentation of aluminous mineral grains, presumably as predominantly felsic feldspars. And the more mafic mesosomes/melanosomes formed during the quiescent phase between subsidence events, as the saltwater reservoir is recharged with aluminum by continued dissolution of nebular dust in aqueous suspension, and solute concentration is increased by progressive freezing of the saltwater ocean. ¶ Authigenic precipitation from an aqueous reservoir side steps the mass balance problem of anatexis. ¶ Primary folding in migmatites is generally limited to classification (identification of the fold types) and degree. By comparison, metamorphic overprinting has been elevated to an exact science. Metamorphic overprinting is often able to identify timing, degree and direction of multiple tectonic episodes, primary isoclinal folds are often dismissed as local sheath folds, fortuitously sectioned through their nose, since sheath folds can be explained by shear forces, whereas randomly-oriented isoclinal folds are not readily explained by conventional geology. ¶ Alternatively, primary folding in migmatites is suggested to be simple slump folding, occurring during the destruction of voids phase of lithification of sediments, prior to Earth impact. ¶ Ptygmatic folds in migmatites present difficulties for all conventional folding mechanisms, particularly in the most dramatic specimens where ptygma fold back on themselves like ribbon candy. Two unconventional explanations for terrestrial folding are presented that attempt to circumvent the most glaring shortcomings of partial-melt theory alone. ¶ One suggested solution to ptygma enigma is a progressive replacement front which migrates away from the vein boundary, in which “volume loss takes place in the vein mantles, while the limbs of the folds increase in volume” (Stel, 1999). 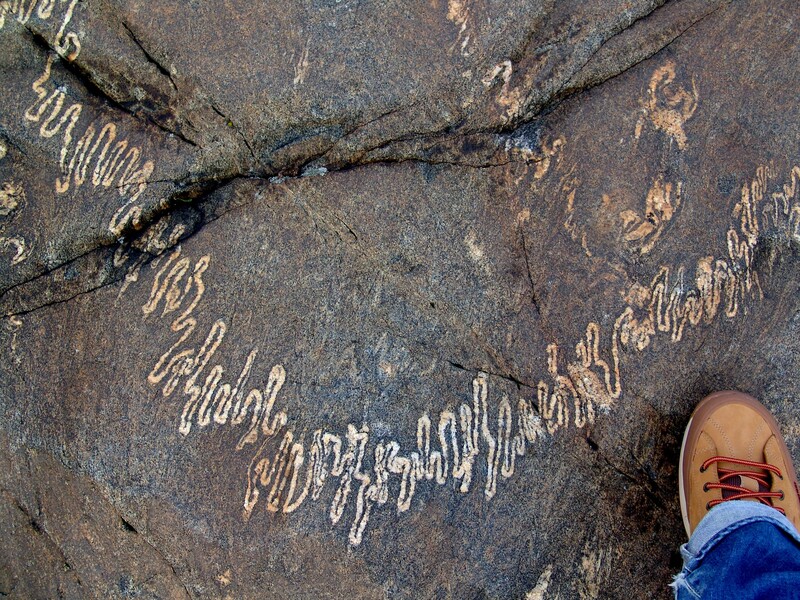 Harry Stel agrees with Brown (Brown et al.,1995) that “ptygmatic structures are not ‘diagnostic’ for the presence of partial melt phases in migmatites”, and “[t]he most direct evidence for the relation of fluid activity and mica breakdown is the presence of offshoot veinlets”, with some veinlets exhibiting relict foliation of the host rock, indicating that veinlets are not melt-injection structures, where ‘fluid’ is understood to be an aqueous brine. ¶ The typically narrow melanosome ‘shadows’ surrounding much-fatter ptygmatic leucosome veins would require additional distant felsic input for mass balance. Additionally, no motive force is offered as an explanation to drive the replacement front, and no explanation is provided for why here and not there. simultaneous accommodation of the host. ¶ Shelley states that the force of crystallization within veins creates expansion of veins into the accommodating surrounding host. Shelley does not waffle between melts and (aqueous) ‘solutions’ as Stel appears to do with his “not ‘diagnostic'” remark, and Shelley is does not confine himself to (superficial) replacement fronts, but states that the force of crystallization within the outward growth and pressure is developed by crystallization on bulk mineral grains in the vein. ¶ Shelley’s mechanism is essentially the very mechanism suggested to operate in a sedimentary KBO setting, but under much-less stringent conditions. Shelley is constrained to operate within lithified rock under metamorphic conditions on Earth, relying on elevated water pressure to crack the rock. By comparison, in an extraterrestrial sedimentary setting, the outward force of crystallization operates in the plastic conditions of unconsolidated/partly-consolidated sediments, under low-to-moderate temperature and pressure. ¶ Gneiss dome formation is far from settled science in conventional geology, with numerous proposed mechanisms representing differing theories and differing contexts. ¶ Alternatively, gneiss domes are suggested here to be anticline wrinkles on a former KBO sedimentary core, with syncline-anticline wrinkling caused by dehydration during lithification of the core, corresponding to the way a grape wrinkles as it shrivels to form a raisin. ¶ A KBO origin for continental basement rock places notable constraints on the composition of KBOs, namely a siderophile-depleted composition that lies on the three-oxygen-isotope terrestrial fractionation line (TFL), which has sufficient buoyancy to float above the terrestrial ocean plates and rise above sea level. The inner solar system asteroids and chondrites possess none of these properties, requiring that the high-angular-momentum hot classical KBOs formed from a different reservoir than the low-angular-momentum reservoir that formed the inner solar system asteroids and chondrites. ¶ Former binary-Companion and the three sets of twin-binary planets in our solar system (Jupiter-Saturn, Uranus-Neptune, and Venus-Earth) are suggested here to have formed in 4 generations, like Russian nesting dolls from former ‘Brown Dwarf’, the original stellar core of our solar system (brown dwarf in mass and ‘Brown Dwarf’ in name). ¶ Brown Dwarf formed at the center of a massive accretion disk that was much more massive than its diminutive Brown Dwarf core. The much-more-massive accretion disk underwent a symmetrical disk instability (symmetrical flip-flop fragmentation (FFF)), condensing a twin-binary pair of disk-instability objects that were each much more massive than the Brown Dwarf core. Following a period of orbital interplay, binary-Sun evaporated former Brown Dwarf into a circumbinary orbit, causing the twin-binary disk-instability objects to spiral inward into a close binary pair, forming former ‘binary-Sun’. But the orbital dynamics involved in evaporating Brown Dwarf into a hierarchical circumbinary orbit caused Brown Dwarf to undergo ‘trifurcation’. ¶ In orbital close encounters between objects with different masses, the principle of ‘equipartition’ of kinetic energy dictates that the less massive object comes away with a kinetic-energy kick, at the expense of the more-massive object, ordered hierarchical systems from chaotic orbital interplay, where the more massive objects sink inward, while the less-massive objects evaporate outward. Not only did the Brown Dwarf receive orbital kicks, but it also received rotational kicks, causing it to ‘spin up’ to the point of fragmentation by a very particular mechanism, resulting in trifurcation, fragmentation of Brown Dwarf into three components, a massive twin-binary pair in orbit around the diminutive residual core. Spin-up fragmentation causes trifurcation into three parts because of the mechanics, where centrifugal force distorts the object into a bar-mode instability, whereupon the twin-binary bar-mode-instability arms ultimately pinch off into their own Roche spheres, forming a twin-binary pair in orbit around the residual core. ¶ Thus, a Brown Dwarf core orbited by a much-larger twin-binary pair induced trifurcation in the core, forming a smaller twin-binary pair in orbit around the residual core, where the twin-binary pair of the 1st generation trifurcation formed the super-Jupiter-mass components of former binary-Companion. First-generation trifurcation promotes second-generation trifurcation and etc, forming; 1st gen, binary-Companion, 2nd gen. Jupiter-Saturn, 3rd gen. Uranus-Neptune, and 4th gen. Venus-Earth, possibly with Mercury as the residual core of the 4th generation trifurcation. ¶ Because the original Brown Dwarf had internally differentiated, forming a siderophile-enriched iron core, trifurcation debris would necessarily be siderophile depleted, with the siderophile core divided among the multigenerational nesting dolls (binary-Companion, J-S, U-N, V-E), but despite being siderophile depleted, the trifurcation debris would lie on the three-oxygen-isotope Brown Dwarf fractionation line, which we know as the ‘terrestrial fractionation line’. And because binary-Companion had sufficient angular momentum to orbit the solar system barycenter at the distance of the inner Oort cloud, or there about, the resulting ‘trifurcation debris disk’ had sufficient angular momentum to condense KBOs beyond Neptune. ¶ Presumably shortly after the trifurcation era, the stellar components of former binary-Sun spiraled in to merge at 4,567 Ma in a luminous red nova that scrubbed the solar system of the earlier trifurcation debris disk, leaving behind its own low-angular-momentum ‘solar-merger debris disk’, which condensed asteroids with live stellar-merger radionuclides, and later, chondrites, largely after the short-lived radionuclides had decayed away. ¶ Our former binary-Companion may have had super-Jupiter-mass components, which themselves spiraled inward over time. The potential energy lost by the in-spiraling close-binary components was presumably transferred to progressively increasing the wide-binary Sun-Companion eccentricity. ¶ A tidal inflection point associated with the solar system barycenter is suggested to have spiraled out through the Kuiper belt from about 4.1-3.8 Ga, driven by the progressively increasing Sun-Companion eccentricity. The tidal inflection point is suggested to have perturbed KBOs, causing the late heavy bombardment (LHB) of the inner solar system. ¶ Ultimately, binary-Companion merged at about 650 Ma in an asymmetrical merger explosion that gave the newly-merged Companion escape velocity from the Sun. ¶ The resulting Companion-merger debris disk is suggested to have condensed a young (non-siderophile-depleted) KBO population, known as the ‘cold classical KBOs’. ¶ The Companion-merger debris disk fogged the solar system, reducing sunlight intensity on Earth, causing the Marinoan glaciation of Snowball Earth. The earlier Sturtian glaciation was presumably caused by multiple, sequential moony mergers with the inspiriting super-Jupiter-mass binary components. ¶ The loss of the centrifugal force of the Sun around the former Sun-Companion barycenter caused all heliocentric objects to fall into slightly lower period orbits, with the resulting orbital perturbation of Earth causing super tsunamis, resulting in the global erosion of the Great Unconformity, at circa 650 Ma. ¶ Finally, the relative aphelia alignment of long-period detached objects, like Sedna and 2012 VP113, is suggested to be a fossil alignment of all heliocentric objects with the former Sun-Companion axis, where shorter-period objects have randomized over the intervening 650 million years. ¶ Aqueous differentiation is defined here as the melting of water ice in the core of a minor planet, here specifically a KBO. Aqueous differentiation is presumed to have occurred spontaneously in large KBOs at the moment of formation by streaming instability, a form a gravitational collapse, by way of conversion of kinetic and potential energy into heat. ¶ Secondarily, a degree of aqueous differentiation may have occurred in the spiral-in merger of binary KBOs, even KBOs too small to have spontaneously differentiated at the moment of gravitational collapse. Perturbation by the Sun-Companion tidal inflection point presumably caused former binary KBOs to spiral in to merge prior to being perturbed out of the Kuiper belt. ¶ Aqueous differentiation at gravitational collapse was followed by radiative heat loss, which began the long process of freezing the core saltwater ocean from the outside in. The latent heat of water clamped the temperature of the internal saltwater ocean to about 255 Kelvins, with a slight increase in temperature with depth, and this temperature inversion circulated the ocean between the cold ice ceiling and the warmer sedimentary core. ¶ Nebular dust in aqueous suspension dissolved into solution until reaching the saturation point of various mineral species, where solvency of mineral species (ions and cations) aided or hindered by the Eh, pH and temperature of the ocean. And thermal circulation, which presented saturated solution to the ice ceiling cold junction, nucleated minerals with solubility proportional to temperature. In addition to the nucleation of new mineral grains, minerals also crystallized on existing mineral grains in aqueous suspension, increasing their mass to the point where then fell out of aqueous suspension and precipitated onto the growing sedimentary core. ¶ Exponential cooling of KBOs following their formation by gravitational collapse, which involved gradual refreezing of the water ice, which had formed saltwater oceans in the cores of large KBOs. And because freezing water ice tends to exclude solute from the growing ice crystals, gradual freezing of the ocean pushed solubilities to the super-saturation threshold, forcing nucleation and crystallization of silicates and other minerals. ¶ And in addition to the gradualism of ‘freeze out’, catastrophic events like subsidence shocks are suggested to create bright line modulation of sedimentation. ¶ A majority of the sand on Earth is suggested to be authigenic, KBO mineral grains that fell out of aqueous suspension at a characteristic sand-grain scale in the microgravity of KBO oceans. Authigenic mineral grains also precipitate on Earth, but on our high-gravity planet, they fall out of aqueous suspension on the scale of clay particles of several micrometers or smaller. 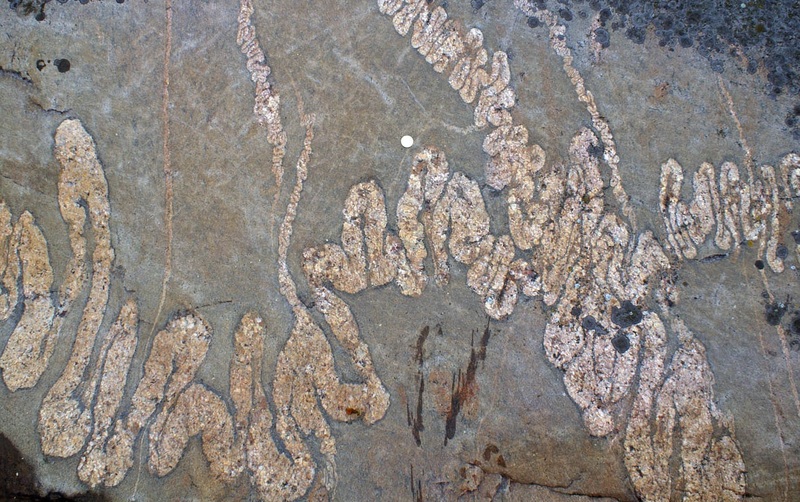 ¶ Conventionally, migmatites form by the secondary mechanism of partial melting (anatexis) of a protolith under elevated temperature and pressure at great depth beneath the Earth’s surface, resulting physical segregation of a partial-melt into felsic-enriched leucosomes and felsic-depleted melanosomes. ¶ Alternatively, the felsic-mafic layering in migmatites is formed by modulated authigenic felsic-mafic deposition, with a variable degree of secondary slump folding superimposed during lithification. This alternating felsic-mafic deposition is suggested to be caused by sawtooth changes in pH of the overlying saltwater ocean. ¶ The solubility of aluminous species is particularly pH sensitive, so the concentration of carbonic acid could effectively control the reservoir of dissolved aluminum. Aluminous species solubility is U-shaped with respect to pH, with an inflection point at about 6-1/2 pH (Driscoll and Schecher, 1990). An abrupt rise in pH from 3.5 to 6.5 would decrease the aluminous species solubility by a factor of more than 100,000, effectively precipitating the entire reservoir of dissolved aluminous species, presumably predominantly in the form of feldspars, the simplest aluminous silicates. ¶ Carbon dioxide solubility can be catastrophically reduced by physical shock, as can be demonstrated by shaking a carbonated beverage. And when dissolved CO2 bubbles out of solution, carbonic acid breaks down into gaseous carbon dioxide to restore the carbonic acid-CO2 equilibrium, with the effect of raising the pH. Thus, subsidence shocks (KBO-quakes) shortly following KBO formation by gravitational collapse could rapidly super saturate core saltwater oceans in aluminous species, creating a frenzy of aluminous mineral grain nucleation and crystallization on aqueously-suspended mineral grains, presumably resulting in rapid feldspar precipitation. Additionally, subsidence shocks might vent gaseous CO2 into outer space through newly opened faults in the icy overburden, causing a more sustained rise in pH. ¶ So KBO aftershocks are suggested to precipitate feldspar mineral grains, which grow by crystallization until falling out of aqueous suspension at a mineral grain size characteristic for the increased agitation rate following subsidence shocks. And the increased circulation following an subsidence shock may also induce crystallization of other minerals that have solubility proportional to temperature, such as quartz/silica, with increased circulation of saltwater past the cold icy ceiling following subsidence shocks. ¶ Super-super saturation of aluminous species may favor crystallization on existing mineral grains in aqueous suspension for the simple minerals, like the feldspar group, whereas the same conditions may favor nucleation of new mineral grains for more complex minerals, like biotite. Both crystallization on existing mineral grains and nucleation on existing mineral grains requires close proximity of the constituent ions and cations; however, for more-complex silicates, such as biotite, the greater number of constituent species may not align well with suspended mineral grains, forcing a greater degree of nucleation of new mineral grains. By comparison, feldspar precipitation may be dominated by crystallization, rather than nucleation. ¶ Thus, the simplest minerals, such as quartz and feldspar, may rain down on the core immediately following a subsidence shock, with a large mineral grain size representative of an increased agitation rate, with mineral grain size decreasing exponentially over time to a quiescent point, tending to create an upward fining progression from felsic quartz and feldspar (leucosomes) to more-mafic complex silicates (melanosomes). ¶ Therefore, in the crystallization urgency of super-super saturation of aluminous species, feldspar mineral grains may quickly grow to sufficient size to fall out of aqueous suspension in the agitated circulation rate following an subsidence shock, whereas smaller, more complex mineral grains may remain in aqueous suspension until the agitation rate approaches quiescence. ¶ Additionally, KBO subsidence shocks may dislodge enlarged mineral grains trapped in the slushy mush of ice crystals floating at the ice ceiling. ¶ Progressive heat loss by recently-condensed KBOs presumably caused ice crystal nucleation, which float to the ice ceiling to form a slushy mush of ice crystals. And most mineral species solubility is reduced at colder temperatures, such that mineral grains may grow by crystallization to considerable size within the slushy mush at the icy ceiling, with the slush preventing them from precipitating to the sedimentary core. ¶ The vibration and agitation of subsidence shocks, however, may have freed enlarged euhedral mineral grains from their slushy prison, which fell through the water column to become incorporated in the lower margin of felsic leucosomes. Thus, outsized euhedral mineral grains in metamorphic rock that are not pegmatites are suggested to possibly have a dropstone origin. ¶ Gneiss domes are often mantled with metasedimentary rock, typically comprised of quartzite, marble/dolomite, and schist. The compositional differences between the gneiss core and its surmounting mantle represents differing depositional conditions of the various regimes. ¶ Baltimore gneiss domes also appear to have the same gneiss-quartzite-marble-schist sequence noticed by Eskola in Finland’s gneiss domes, as illustrated in the following sketches. ¶ Authigenic schist is suggested to precipitate predominantly from hydrothermal solutions, emanating from the lithifying gneissic core, whereas the underlying gneiss is suggested to predominantly precipitate from the overlying ocean, indirectly from the dissolution of nebular dust in aqueous suspension. So gneiss is suggested to be a primary precipitation from dissolved nebular dust, whereas schist is suggested to be secondary precipitation from minerals leached by hot hydrothermal fluids exiting the gneissic core during lithification. ¶ Schist is often named for its primary mineral constituent, with its wide-ranging variability presumably attributable to its wide-ranging deposition conditions. The frequent proximity of chemically different schists in the geologic record suggests highly localized deposition, perhaps after the overlying ocean is frozen solid, with only small melt pockets overlying hydrothermal vents. 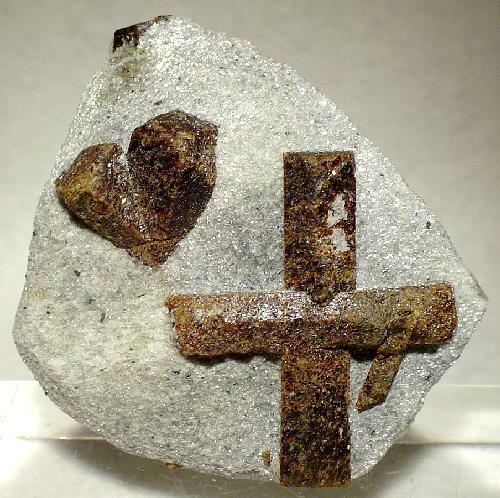 ¶ Euhedral-crystal dropstones, such as garnets and staurolite, are particularly prevalent in schist, which may be liberated from the icy ceiling when hydrothermal vents increased their flow rate, melting into the overlying icy ceiling and liberating euhedral-crystal dropstones. ¶ The origin of the schistosity of schist is unclear, with the flat sheet-like grains (mica, talc, and etc.) presumably forming by metasomatism/metamorphism, perhaps from clay precursors. ¶ Schist can also contain prominent ptygmatic leucosomes like migmatite gneiss, and presumably from the same cause, forming as aqueous drains where the constituent mineral grains grow by crystallization, sometimes buckling outward into the surrounding matrix as ptygmatic folds. ¶ If homogeneous global precipitation forms gneiss, then heterogeneous local precipitation from hydrothermal fluids may test even the broad definition of schist, perhaps straying into quartzite and dolomite, and etc. Conceivably, a hydrothermal vent could create multiple precipitation plumes, like a comet tail dividing into a gas tail and a dust tail. ¶ Notably, calcium carbonate solubility has a negative temperature dependence, such that a reactivated hydrothermal vent that would warm the surrounding water would tend to precipitate limestone/dolomite. In a reactivated hydrothermal vent with the overlying ocean frozen solid, the hydrothermal fluids would immediately chill, nucleating and crystallizing quartz and other minerals, where quartz as the simplest mineral might tend to crystallize rather than nucleate and rain down as sand. 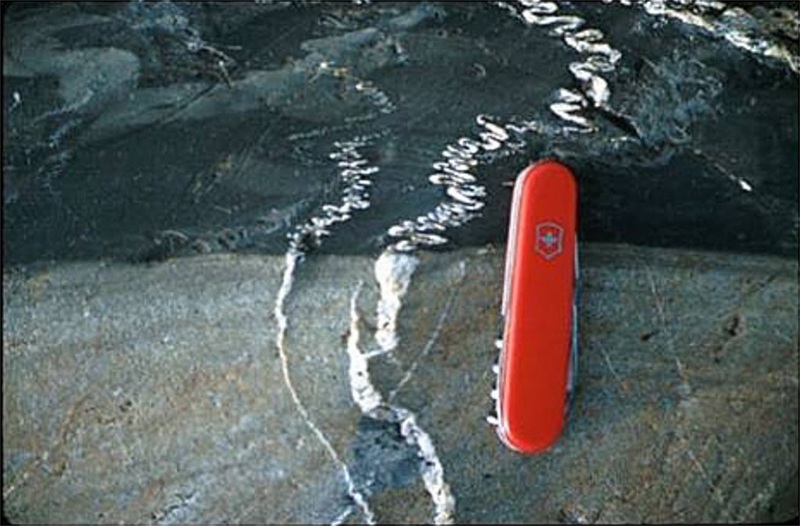 Later as the fluid pocket grew in size and in temperature, calcium carbonate precipitation may predominate, followed by schist, forming the typical, gneiss, quartzite, marble, and schist sequence. ¶ The domal structure of gneiss domes is suggested to be caused by wrinkling during lithification dehydration of the gneissic sedimentary core, that wrinkled as it shriveled like a grape dehydrating into a raisin. In internal migmatites, this shriveling took the form of slump folding, whereas at the surface of the sedimentary KBO core, the lithifying sediments were able to fold up into the void of the overlying saltwater ocean, forming syncline troughs and gneiss-dome-scale anticlines. ¶ Presumably the scale of gneiss domes is proportional to the scale of the originating KBO and its gneissic core, with larger gneiss dome systems corresponding to larger former KBOs. Gneiss domes exceeding 100 km in length may have belonged to former KBOs exceeding 1000 km Dia., and maybe considerably larger. ¶ “Most gneiss domes are elongate parallel to the strike of the orogen” (Whitney et al., 2004) While wrinkling of all types is invariably elongate, gneiss-dome alignment with the strike of exhumed orogens is surprising, with orogeny driven by tectonic collision; however, the underlying basement geometry may dictate the strike of the local orogen. I.e., orogen exhumation apparently typically follows the long axis of underlying gneiss domes. ¶ Conventional geology suggests that metamorphic folding occurs at elevated temperature and pressure in lithified rock, deep below Earth’s surface, with fold type illuminating the cause of the folds. Indeed tectonic orogeny creates the synclines and anticlines of mountain ranges by large-scale folding of rock up into the void of the atmosphere, but the scale of syncline-anticline tectonic folding is several orders of magnitude larger than the centimeter-scale folding typical in migmatites, and solid rock at depth—partial melting or no partial melting—has no voids to fold into. ¶ Folding in migmatites resembles slump folding in terrestrial sedimentary rock, and if migmatite is indeed extraterrestrial sedimentary rock, then apparent slump folding can be actual slump folding. ¶ Folds in migmatite are often identified as 2-dimensional sheath folds, fortuitously sectioned through the nose of the fold across a former shear zone, when they’re identified at all. Alternatively, in a sedimentary slump folding context, there’s no constraint on the folds being randomly-oriented isoclinal folds, removing the fortuitous (hand-wringing) element. ¶ In slump folding, the expulsion of aqueous solution between sedimentary grains during the destruction of voids phase of lithification provides the voids at depth to fold into, as late lithifying sediments slump into voids opened up by early lithifying sediments. ¶ Folding in KBO metamorphic rock has the additional mechanism of geometry driving slump folding. During lithification of a sedimentary core, not only does the thickness of each sedimentary layer decrease, but the circumference of every layer also decreases as the entire core densifies, forcing ‘circumferential slump folding’. On Earth, the vast circumference of the planet means that the circumference change of lithifying sediments is imperceptible, whereas in a sedimentary KBO core undergoing lithification, not only does the radial thickness shorten during lithification, as it does on Earth, but the lateral (circumferential) dimensions shorten as well. Bulk KBO sediments are forced to undergo circumferential slump folding for the same reason that grapes wrinkle when dehydrating into raisins. Something similar to circumferential slump folding can occur on Earth under unusual conditions, such as the lithification of sediments in a V-shaped trench or crevice, where pithy sedimentary layers are forced to fold as they densify toward the pointy end of a trench or crevice during lithification. ¶ Migmatite may be particularly susceptible to slump folding due to the dramatic variation in mineral grain size and composition between juxtaposed felsic leucosomes with large mineral grains, and mafic melanosomes with small mineral grains, presumably resulting in differential lithification, where the late lithifying sediments fold into the voids opened up by the early lithifying sediments. ¶ The most exaggerated examples of a physical phenomena will generally give a genuine theory an opportunity to shine, while forcing flawed theories to grasp at ad hoc hypotheses, hand waving or fine tuning to prevent falsification. Ptygmatic folds are the most dramatic of all metamorphic folds, so it’s not encouraging that these folds are typically played down in significance in academic petrology, i.e., they don’t cause academia to shine. ¶ The conventional anatectic explanation for ptygmatic folding appears to engender a contradiction. Felsic leucosomes are presumed to form by felsic-melt segregation, where felsic minerals tend to melt at lower temperatures than mafic minerals following Bowen’s reaction series; however, ptygmatically folded veins rely on the felsic vein having greater competence than the host rock, which presumes that more-mafic surrounding matrix (mesosome) is dramatically more plastic than the ptygmatically-folded leucosome vein which supposedly formed by partial melting. The circa 6:1 matrix shortening required to fold the leucosome back onto itself, resembling ribbon candy, inevitably fails to balloon out adjacent felsic-mafic layering, requiring matrix shortening to fortuitously extrude perpendicular to (into and out of) the section plane. ¶ While the majority of folding in authigenic KBO migmatites is suggested to form by slump folding, ptygmatic folding requires a different explanation. ¶ In lithifying KBO cores, the destructed voids between sedimentary particles were once filled with brine, which escaped into the overlying ocean through hydrothermal vents. Brine naturally followed path of least resistance though the variably-porous lithifying sediments, presumably preferentially flowing through the coarse mineral grains of felsic leucosomes, which acted as French drains. When acting as aqueous drains, these felsic leucosomes are designated ‘veins. Felsic leucosome layers were laid down the bedding plane, but to vent aqueous brine to the surface required cross bedding veins as well, which may often cut through the nose of slump folds. ¶ As the brine cooled on its buoyant rise, most mineral species solubility decreased, since the solubility of most mineral species is proportional to temperature, resulting in crystallization on existing felsic mineral grains within the veins. And the growth of felsic mineral grains within veins created outward pressure, both lateral and longitudinal. “The grain size of quartz and feldspar in the veins is between 10 and 25 times larger than in the host rock (0.2 mm in the latter” (Stel, 1999). ¶ Growth of mineral grains by crystallization caused 3-dimensional expansion of the veins, fattening veins in the two lateral dimensions and buckling veins in the longitudinal dimension, creating ptygmatic folds. Again, this is the mechanism suggested by Shelley, “[t]here are two internal forces of expansion within the vein: that of increase in volume due to crystallization from solution and that of force of crystallization of the vein mineral” (Shelley 1968), albeit in a lithifying sedimentary setting, rather than a metamorphosing lithified setting. ¶ The following image shows a pair of white (quartz or calcite?) veins cutting through two very different matrix types, apparently tan sandstone at the bottom and black shale above. The veins were presumably former aqueous veins, which developed very differently in the contrasting mediums. The black shale sediments were apparently much more compliant than the former tan sandy sediments, such that the vein was evidently able to buckle ptygmatically into the soft shale sediments, while the stiffer sandy sediments effectively prevented longitudinal buckling, forcing the volume increase of the vein growth to manifest itself in the lateral direction by way of fattening. In this case, the ptygmatic folding may be terrestrial, albeit by the mechanism suggested for extraterrestrial ptygmatic folds. ¶ Three-dimensional expansion of veins due to internal crystallization explains the tendency to maintain constant vein width in ptygmatic folds; however, superimposed slump folding may locally thin or break dikes, and variable plasticity of the confining mafic matrix may variably constrain longitudinal buckling into ptygmatic folds. When progressive lithification stiffens the surrounding matrix to the point of preventing longitudinal ptygmatic buckling, veins may still be able to fatten in the lateral direction. And as lateral fattening is resisted by still-greater lithification, the force of crystallization may balloon into aneurysms at points of relative weakness in the surrounding matrix, forming boudinage. ¶ Finally, resistance from the lithifying matrix prevents any further lateral or longitudinal growth of the veins when impinging mineral grains within the veins become more susceptible to pressure dissolution at points of contact than growth by crystallization, with subsequent crystallization confined to filling in the remaining voids. ¶ S-type granites are suggested here to be intrusive, authigenic felsic sediments precipitated within gneissic cores of KBOs undergoing lithification. By contrast, I-type granites are intrusive igneous granites formed on Earth. Both authigenic S-type and igneous I-type granites are presumed to be emplaced by intrusive hydraulic pressure. ¶ Hydrothermal blockage in a vein system, that drained a sedimentary gneissic core undergoing lithification, may be the origin of the intrusive hydrothermal fluids that precipitate S-type granites. Presumably hydraulic pressure developed by the buoyant fluids causes delamination in the surrounding country rock, forming a sill, or creates an aneurysm in a vein, resulting in a pluton. Freezing solid of the overlying ocean may have been a common cause of hydrothermal blockage, forcing buoyant fluids to intrude the surrounding country rock. And the low density of intruding hydrothermal fluids would not support partially-lithified ceiling sediments from ceiling collapse, resulting in the observed gneissic or supracrustal xenoliths and enclaves, common in S-type granite. ¶ In Black Hills National Forest, the Calamity Peak Granite of the Yavapai Mazatzal craton is texturally stratified into alternating textures of fine-grained granite, with < 2 mm grains, and coarse-grained pegmatite, with perthite crystals up to 1 meter long. Additionally, the granite layers are themselves laminated on a millimeter scale, with laminae, 2-20 mm thick. This laminated fine-grained granite is known as ‘line rock’, composed of alternating bands of light and dark minerals, with tourmaline constituting the bulk of the dark mineral. ¶ The textural granite-pegmatite layering, with superimposed light-dark layering suggests a state of orbital perturbation while still in the Kuiper belt. The light-dark layering suggests the circa 300 year orbital period of the former KBO itself, while the textural granite-pegmatite layering suggests a much-longer period of the former Sun-Companion orbits around the solar system barycenter. In this orbital barycentric setting, granite may have formed near apoapsis (greatest Sun-Companion separation), when the tidal inflection point created active aphelia precession (orbital perturbation), actively squeezing water from the core. Then the pegmatite layers may have formed during the quiescent remainder of the Sun-Companion orbit, with metasomatism forming massive pegmatites under nearly quiescent conditions. ¶ The above scenario suggests a LHB age for the granite, with a > 4,567 age for the surrounding gneissic/schistose country rock. Late granite formation from latent aqueous fluids also suggests that core lithification was not complete at the time of the LHB, and perhaps tidal torquing by the Sun-Companion tidal inflection point was even a requirement in the lithification process. I.e., perhaps the sedimentary core of a quiescent KBO will not fully lithify without tidal torquing to wring out the water. ¶ The ‘bulk modulus’ (inverse of compressibility) of granite is more than 20 times that of water, such that water ice would absorb more than 20 times as much compressive work energy of an impact shock wave of an icy-body impact, compared to an equal volume of silicates. Thus a thick mantle of relatively-compressible water ice surrounding a gneissic KBO core would absorb the lion’s share of the kinetic energy of a KBO impact as compressive work energy. This is suggested to clamp the impact shock wave pressure below the melting point of silicates. ¶ The shock absorbing potential of relatively-compressible ices, however, would not have been sufficiently protective to prevent the formation of high-pressure polymorphs in silicates, such as coesite, so their absence is presumably due to prolonged dwell time at metamorphosing temperatures and pressures on Earth within their impact craters, deep below the surface. Metamorphism presumably reset both high-pressure polymorphs and isotope geochronology, with geochronology reflecting the cooling dates of terrestrially metamorphosed KBO cores as they emerge at the surface by buoyant rise and/or by tectonic collisions, often uncovering gneiss domes in orogenic zones. ¶ Hot classical KBOs are suggested to have ‘condensed’ by streaming instability (gravitational collapse) against Neptune’s strongest outer resonances from a siderophile-depleted reservoir that lay on the 3-oxygen isotope terrestrial fractionation line. ¶ Large KBOs underwent spontaneous internal aqueous differentiation at formation by gravitational collapse, melting saltwater oceans in their cores. Aqueous differentiation was accompanied by authigenic precipitation, with felsic-mafic modulation mediated by sawtooth pH fluctuations, forming sedimentary cores with a gneissic composition. ¶ KBO core rock slump folded during lithification, as the densifying core expelled brine through a network of felsic veins that acted as French drains, channeling the buoyant brine out of the core. Dehydration of the core, implicit in sedimentary lithification, caused slump folding, which is most pronounced in migmatite gneiss. Additionally, ptygmatic folding occurred in felsic veins which channeled brine from the core, as crystallization on the felsic mineral grains created outward pressure, forcing some veins to buckle into dramatic ptygmatic folds. ¶ A former binary-Companion to the Sun is suggested to have caused orbital perturbation of hot classical KBOs, causing the LHB of the inner solar system, circa, 4.1–3.8 Ga.
¶ S-type granite is suggested to be intrusive authigenic precipitation of granitic sediments, which may have intruded during the LHB, caused by tidal torquing by the Sun-Companion tidal inflection point. ¶ The vast majority of gneissic continental KBO rock was presumably delivered to Earth by way of very-large (>> 100 km) KBO impacts of the LHB era, with subsequent impactors being substantially smaller and less likely to have undergone aqueously differentiation. An extraterrestrial origin for continental basement rock also depends on its surviving Earth impact without melting or vaporizing. Presumably the relatively-high compressibility of thick icy mantles surrounding the gneissic sedimentary cores absorbed the lion’s share of the impact energy, protecting the silicate cores from melting on Earth impact. ¶ Then, a variable degree of metamorphism of KBO core rock occurred on Earth, 10s of kilometers beneath the surface within their KBO impact craters. Geochronology of KBO core rock, however, dates to closure temperatures as it cools during ascent and exhumation at the surface in orogenies. Chappell, B. W. and White, A. J. R., (2001), Two contrasting granite types: 25 years later, Australian Journal of Earth Sciences, Volume 48, Issue 4, pages 489–499, August 2001.